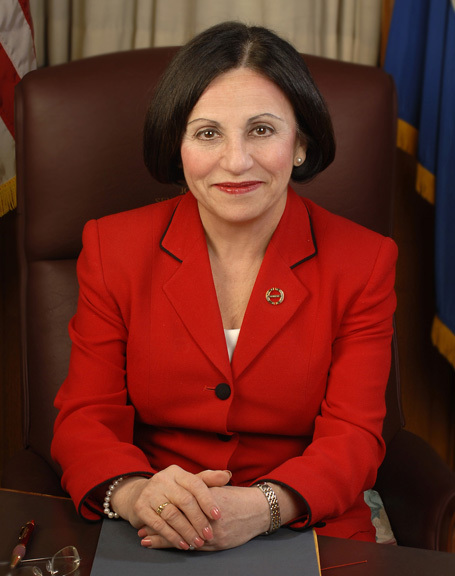 Hartford, CT – State Sen. Toni Boucher(R-Wilton) released the following statement today in reaction to Governor Dannel Malloy’s two year $37 billion budget proposal. “The Governor’s two year budget address dished up hope for a rosy economic outlook, lower unemployment numbers, reductions in the sales tax, elimination of the business entity tax, full day kindergarten, restructure of student college loans, prisoner reform programs, and a 5 year $10 billion – transportation plan among other goodies. “But, how can the budget presented spend 3.1% more after a 16% increase in the last 4 years while the state faces a $2 billion dollar deficit in the next biennium? One of the greatest assumptions is the forecast on income tax revenues. The administration assumes there will be a 25% increase over last year. However, economists are dubious that the high expectation of a roaring comeback will materialize. “The burden of a state government that has grown 300% over the years while population and job growth has been flat is weighing heavily on and suppressing the private sector. “The lower unemployment numbers touted – more clearly reflect a loss of the labor force as Connecticut is now 50 out of 50 in job creation- dead last! No wonder more people are moving out of state than moving- in. This has resulted in fewer people paying more of the taxes and it is painful. “The reductions in the sales tax, although welcome, are paid for by eliminating the planned tax exemption on clothing under $50. This results in a net tax increase of $68 million next year. There is an increase in personal income taxes for single filers which could harm single mothers. “Other tax exemptions and tax credits are also eliminated. In addition, the temporary 20% tax on corporate profits and the hospital provider tax are both made permanent. These are bad policies that are not welcoming to any business. “Town education funding (ECS) remains flat. Higher education financial support is reduced, putting more pressure on already exorbitant tuition costs. “Prisoner reform programs that help to ease ex-offenders into society and become productive are widely supported. However, eliminating mandatory minimum sentences, making drug possession a misdemeanor, decriminalizing all drugs, early release programs and reducing drug free zones around schools will put the public and our children at greater risk. “The much anticipated bold 30 year transportation plan includes something for everyone (and one thing many despise- a new Super 7 highway). This plan will cover a span of 30 years at a cost of $100 billion. Not covered in the Governor’s address is a plan to pay for it, not even a hint. “The question of the day remains, where is $2 billion in the next 2 years, $10 billion in 5 years and the $100 billion over 30 years coming from? The response; a task force will be created to come up with some ideas on funding sources. Could this be the start of a process to introduce tolls or increase in the gas tax? “Yes, there are good proposals in this budget, very good ones that are being over shadowed, however, by the lack of attention to some of the highest cost drivers the Connecticut taxpayer is shouldering. “Labor unions in Connecticut have publicized that they have increased their membership by 24,000. The administration at the Capitol has approved substantial salary increases that have raised some eyebrows. In addition, fringe benefits have grown from 59%to 82% fueling the state deficit.